The media has been all over the Asiana Air 214 crash. They have been labeling it a tragedy and having all sorts of “experts” on their channels to explain what was going on. They will make news out of nothing and like to spice up the news. A picture I took of CNN a few years ago. They made a story out of a windy day at a airport in Canada. 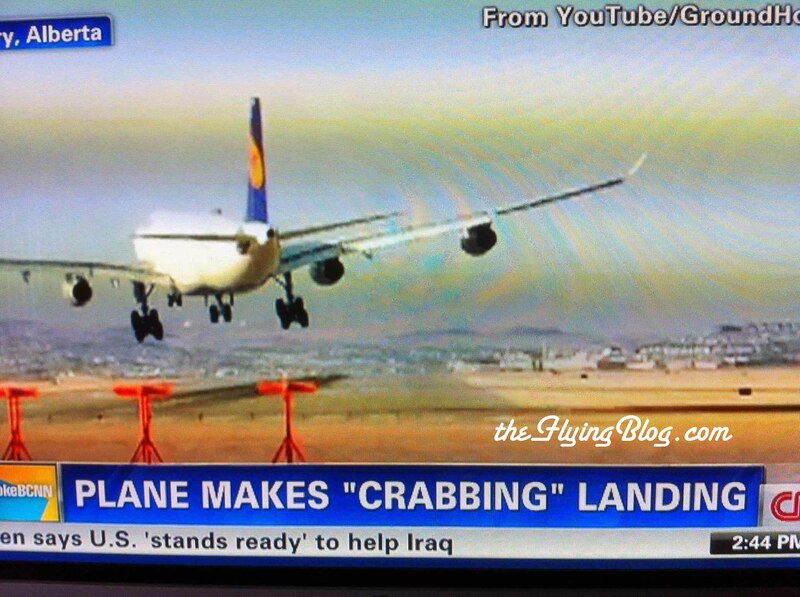 They do not realize that crabbing to land is a very normal thing, and not a news worthy event. The two fatalities that occurred on Asiana Air 214 are the first fatalities for a major airline company in the United States for over a decade (there have been a couple regional accidents, but the majors have remained incident free). It was also the first two fatalities ever to occur on the Boeing Triple 7. American airspace is one of the most advanced in the world and the controllers are highly skilled. American pilots are well trained and highly competent. Compared to other methods of transportation, air travel is by far the safest. Therefore the media has completely blown the incident that happened to Asiana Air 214 out of proportion. Although it is very sad that two young people lost their lives, it is important to remember that over 250 people survived this incident. The media is labeling it has a tragedy and a disaster. Loss of life is always sad, but this is nothing compared to the safety record of aviation in the past. The 1980’s and 1990’s were a myriad of crashed. The deadliest year for commercial aviation was in 1985 when over 2,000 fatalities occurred within one year from commercial aviation. It seems when the media is covering something that you know very well; you can always poke holes in it. I was watching CNN the day of the SFO crash and it was very cringe –worthy. Their so-called “experts” knew nothing and were just saying words in order to fill the airspace. They claimed several times that the wings had fallen of the airplane. While the pictures they should on the screen clearly should the plane with the wings still attached. They did not wait for real investigations, but instead reported non-stop on stuff that was false and clearly not fact checked. The media tends to blow stuff out of proportion. This is especially true with aviation. When you hear of a news story regarding aviation, go online and find some reputable sources within the industry. They will give you a correct and technical description of what happened. By now, everyone has heard by now that a Boeing 777-200 crash landed yesterday at KSFO while landing on 28L. It was operated by Asiana airlines out of Korea. The Triple 7, AAR214, appeared to be way to low on approach and came into contact with the bank before the runway. It looks like the landing gear hit first and made the plane start to fishtail making it completely uncontrollable. It hit on its tail very hard, ripping of the horizontal and vertical stabilizers. The plane then spun on its belly and ended up 2,000 ft. from the end of the runway. Most of the passengers escaped via the inflatable slides. Unfortunately two fatalities were found outside the plane later in the day. Passenger accounts say that the plane felt like it was low on the approach. Before the strike they said the nose of the plane pitched quickly up. A very similar incident occurred to a British Airways 777 at London Heathrow in 2008. The plane suffered icing in both the engines fuel lines and the pilots lost all power. The plane landed short with a thud and it ripped the gears off. The plane slide on its belly and all passengers survived. This incident was due to the icing and the pilots did everything they could to keep the plane a loft. Was this the same thing that happened at KSFO now? The weather was beautiful at the time of the crash and planes were flying in VMC and getting visual approaches to 28L and 28R. The ILS, instrument landing system, was inoperative for both runways during the crash due to construction. This should be a non-issue though. Pilots should be able to land their plane visually, without the aid of an autopilot on the glideslope. The Boeing 777 has a fantastic safety record. In fact the two passengers that passed yesterday were the first fatalities in the plane ever. The 777 was released in 1995 and there are over 1000 models flying the skies today. Using all this information here is what I think caused the plane to crash, from least likely to most likely. 1. The plane suffered the same fate as the 777 that crashed in London. It somehow lost all power when on low approach and there was nothing the pilots could do. This is unlikely however. The Asiana 777 had Praight and Whitney engines from while the British Airways 777 had Rolls Royce engines. There was no reports of any problems from the crew of the Asiana 777 and the problem has been researched extensively after the London incident. 2. The pilots were unaware that the ILS was inoperative for the runways that day. It is still possible to pick up a localizer signal even if it is inoperative. The pilots might not have checked the notams and flew the localizer anyways. If they did not visually check their approach, by looking out the window and checking the papi, they very well might have flown it into the ground. As an instrument student I know how important it is to make sure the localizers are working by identifying them and listening for the morse code. 3. The pilots flew an unstable approach and decided to land instead of going around. Flight data from FlightAware show that the plane was above glideslope and slow for most of the approach. The pilots realized this and tried to get the plane down quickly to catch the glideslope. The pilots most likely descended too quickly and went through the glideslop. Seeing 4 red, “red over red and your dead” as the old saying goes, on the papi, the pilot went to initiate a go around. This was started too late however. The engines did not have enough time to spool up so the plane hit the sea embankment. This caused the vertical and horizontals stabilizers to come off sending the plane crashing to the ground. The inability of the pilots to correctly fly a visual approach caused Asiana 214 to crash. It seems that this has been a problem for carriers based in Asia before. Flightglobal published an article about the inability of some pilots to land without an ILS working. Now remember I am not a crash investigator and these are just my own opinions from all the information I have gathered. The FAA will have conclusive data eventually. They have the black boxes and will begin to analyze the fight recorder to figure the exact cause. If your interested, this video shows what a proper 777 landing looks like. There is also the ATC recordings from the incident. Imagine this: You are at an outside BBQ with your friends on a beautiful day. The food is great, and you are conversing with a close friend. Then you hear the faint sound of a Lycoming humming along from high above. Your eyes drift skyward and you crane your neck to catch a glimpse of the craft above. Over the East Shore of Lake Tahoe looking Northwest. Scanning the skies, you finally spot the aircraft. You have forgotten the conversation you were just having and your mind is only focused on the airplane overhead. You try to figure out the model and type and wish you could be up there with them. The plane flies off into the horizon and you once again turn your attention to the terrestrial world. Your friends are frustrated because you clearly did not pay attention to them and found the speck in the sky more interesting… But, they will never understand what possesses us aviation geeks to scan the skies every time an airplane passes above us, to drive slowly by airports hoping to catch a glimpse of a landing or departing airplane, or simply daydreaming of flying. Leonardo Da Vinci, who unfortunately never got to experience flight, summed it up very nicely: “For once you have tasted flight you will walk the earth with your eyes turned skywards, for there you have been and there you will long to return.” Flying myself in a little 172, or flying with a large commercial airliner, the wonders of flight will never leave me. I can spend a long flight simply staring out of the window, even when crossing an ocean. Men have always earned to soar like the birds, and that is a fully realized dream in today’s world. Currently there is a heat wave blasting the southwest. Luckily Reno is only going into the low hundreds compared to the low 120’s in Las Vegas. Reno is a beautiful place to live. We get all four seasons and have many amazing lakes and mountains surrounding us. We also get about 300 days of sunshine every year. During the winter we get days where the temperature is right about freezing, but the sky is completely clear and beautiful. This makes for a wonderful day of flying. The air is cold is dense and the little Cessna’s perform so much better. On a VFR approach into Hawthorne, Nevada (KHTH). Over Walker Lake looking at Mt Grant, 11,280 ft. Check out Buller Creations for more of my Aviation Photography. During the winter the mountain caps are covered in snow and the surroundings are absolutely beautiful. Airports are easy to spot as the back runways stick out from the snow. The air feels crisper and seems the clearest it will ever be. The air is smooth and climb rates are great during this time. There are a few downsides. There are obviously less sunny days during the winter, but still a very good amount. If there is any sort of clouds in the winter it is almost guaranteed that you will get iced up if you enter them. Winter flying is nice for the pilot, but harder on the pilot. The pre-flight is often done right around dawn when it is extremely cold outside. Make sure to check for frost that may have built up on the plane overnight. The engine is going to need some extra priming, so keep the fuel pump on for a few more seconds before turning the key. Pair of gloves, with the fingertips cut out, is a very good idea to have. The fingertips are cut out to allow use of small knobs and dials. Any winter flying stories of your own? Comment below. When I first started to fly one of the most daunting aspects for me was the radio communications. On the first few flights I had a really tough time following along and understanding what was being communicated. I was nervous that I would never become proficient and that I would make a fool out of myself. I did not like that fact that not only ATC could hear me screw up, but a lot of other pilots as well. I was able to overcome this nervousness very quickly and I am now very proficient at the radio and completely comfortable using the radio. There are several factors that I attribute to this. My flight school is located at Reno International Airport, KRNO. This is a class charlie airspace. This makes the radio communications more complicated and intense. This makes for a pretty steep learning curve to overcome. Looking back I am very glad I chose a large airport to due my flight training at. It becomes the norm to call up several different frequencies before you can depart. It makes flying into another class charlie or a larger class bravo airport an easy and pleasant experience. My CFI used to teach at a smaller airport and said his students were often very nervous when having to do the three touch and goes at a towered airport. KRNO. Midfield on the Left Downwind for 16L. Another factor I attribute to my good radio skills is one of my former CFI’s. He was a former F-18 pilot and a Top Gun instructor. The Navy’s Top Gun School is actually located in Fallon, Nevada, a short flight from Reno. He believed in very professional radio communications and expected the same of me. He taught me many things about the radio and communications I still use every time I fly now. Live ATC, is a service that provides live ATC streams of nearly any airport in the world. I used this a lot when I first started flying. I would be studying and simply have the one for KRNO playing in the background. I would try to comprehend and visualize all that was being said. This helped me understand ATC better. It is also an extremely fun service to use. Sometimes the bad weather in Reno leads to some interesting flying, which in turn is fun to listen to on the radio. It is also available as an app so it is portable too. Radio communications is a vital aspect of flying and is something every pilot needs to be proficient at. Many pilots judge other pilots by their radio work. Even the small things count. A Horizon (Alaska) airlines pilot called the runway “sixteen right” instead of the correct “one-six right.” Although not a big deal, still makes me cringe a little. Over the last decade Cirrus has exploded onto the general aviation market becoming one of the best selling aircraft available. They produce the SR-20, SR-22, and the SR-22T. They have a sports car appearance and look impressively large when sitting on the ramp. They are the favorite single of many cross-country fliers. Unfortunately they also have a reputation and is referred to many as a “doctor killer.” This is a name used for expensive and complex aircraft that is often bought by wealthy, yet inexperienced pilots. Many of the incidents that they have been involved in have been due to pilot error. My CFI has taught several people to fly in the brand new cirrus they recently purchased. Despite all this they are a wonderful plane and they have been planning to bring something new to general aviation. The Vision SF50 will be a smaller jet and aimed at the general aviation market rather than the business jet industry. It will have an instrument panel that is laid out in a very similar manner to the SR-22’s. Cirrus claims the jet will be very easy to fly and a perfect way for SR-22 owner’s to move to a jet. It has an operating ceiling of 28,000 feet and a max cruise at 300 KTAS. There will be a heftier price tag attached to the new jet. Cirrus claims to already have over 500 production orders on the jet. This week they got one step closer to finally producing the SF50. They have been expanding and getting new equipment for their Grand Forks, North Dakota plant since may. The expansion is to make way for the new production line going in for the Vision SF50. They have also recently received a large piece of equipment called an autoclave. This contraption will allow them to pressure mold large pieces of carbon to use on the Vison SF50 and newer generations of the SR-22. I am a big fan of Cirrus aircraft. I have yet to fly one myself, but am eagerly awaiting the day I get that opportunity. The SR-22’s are larger in life then they seem in pictures and they have multiple, beautiful, color schemes available. I hope the Vision SF50 becomes a success for them. Nestled in the Sierra Mountain range is one of the most beautiful lakes in the world. It is located on the border between California and Nevada. It has a surface elevation of 6,225 feet and is the largest alpine lake in America. I grew up in Reno, which is only a short 30-minute drive from the northern shores of Tahoe. I have many memories camping at the beautiful lake in the summer, spending long days lounging on the beaches or out on the water on a boat. Lake Tahoe is a large part of everyone who lives in this area’s lives. In the winter Lake Tahoe is surrounded by some of the nations best ski resorts and offers great nightlife in South Lake Tahoe. 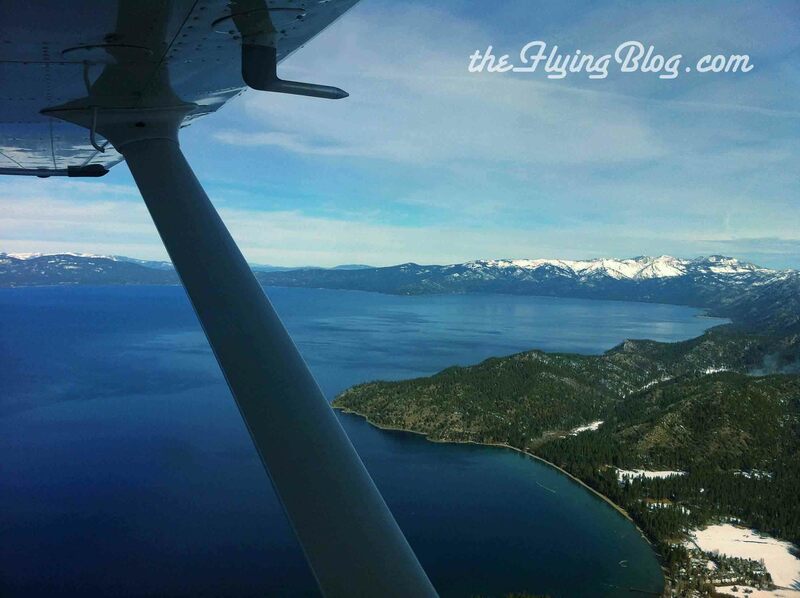 It brought me great joy as a pilot to be able to see Lake Tahoe from the sky. Flying over Tahoe is an absolutely amazing flight. The water is extremely blue and clear. I like to take the Verdi valley pass to get to Tahoe from Reno. This brings you up over the Truckee area. You can see several reservoirs, Stampede and Boca, and you fly over Truckee Airport. Then you fly over Northstar ski resort and finally over Lake Tahoe. Flying to Tahoe is not necessarily an easy task however. It is at a very high elevation and surrounded by mountain peaks that are even higher. There tends to be a good deal of turbulence when crossing over these mountain peaks to get into Tahoe. There have been known to be very strong downdrafts. There is one airport located in South Tahoe, KTVL. Density altitude needs to be taken very seriously up here. In the summer it can get very warm and there have been several accidents due to the miscalculation of density altitude. There are only a couple instrument approaches and all have very high minimums. Lake Tahoe is a challenging yet very rewarding place to fly to. If you ever get a chance I suggest that you take the flight up there and enjoy the spectacular views. My name is Daniel Houe Sorensen. I have a strong passion for aviation and am a pilot myself. I currently live in Reno and I am an undergraduate at the University of Nevada, Reno.